Give your gently used toys to your local church. The children's section always needs new toys, but leave the ones with a lot of little pieces for the garage sale. 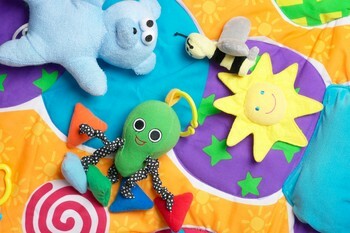 If your children attend the church, they can still play with the toys Sunday morning without them cluttering your home. Or donate them to your doctor's or dentist's surgery so the children have something to play with while waiting for appointments. Just make sure they are complete, clean and have no small, loose or broken parts. Think: Would you let your children play with them? If they aren't safe for your children, then they aren't safe for anyone's children, and toss them. That's a good idea. Once my children outgrow their toys, any worthy ones will be passed on. After all, I picked some of them up in charity stores and council pick ups and don't wish useful things to go straight to landfill.